Update from Sarah Jane, Sept. 29-30, 2018: So, Jeff Flake actually did a give-with-one-hand-take-away-with-the-other move. Flake, a Republican Senator from Arizona who sits on the Judiciary Committee, voted to advance Brett Kavanaugh’s nomination out of the committee, but made it conditional. He asked for a pause of one week to allow the FBI to re-open its background check on Kavanaugh and look into various charges. It’s assumed Flake wants to limit it to the three named alleged victims. Trump, who has to formally permit the FBI to re-open the background check, has indicated he will do so. The answer, as always, is to call. On weekends, you’ll be leaving voicemails. 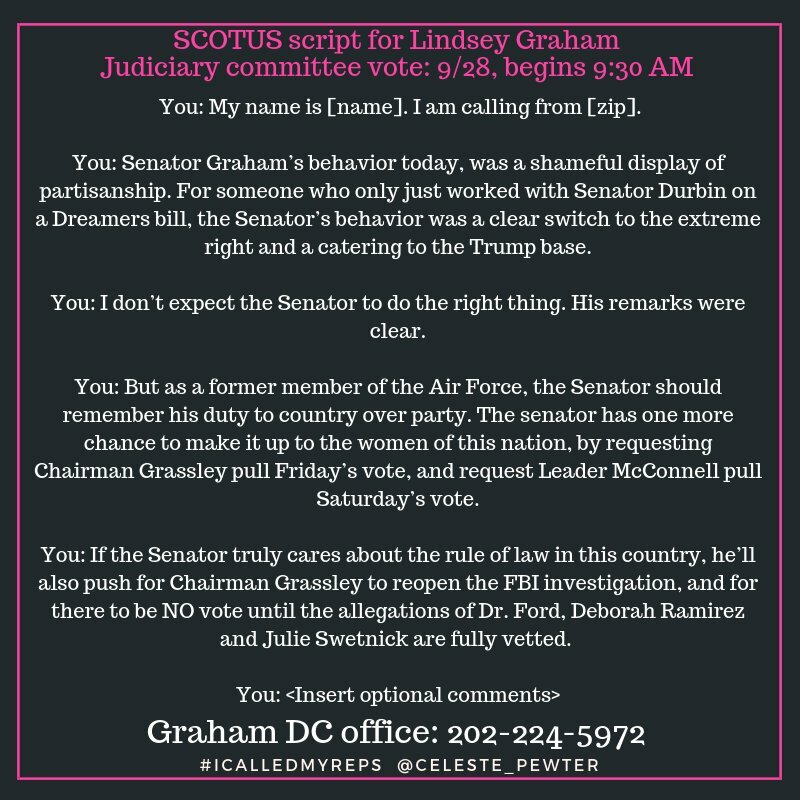 If you have not called your Senators yet, now is the time. If you’ve called before, call again. 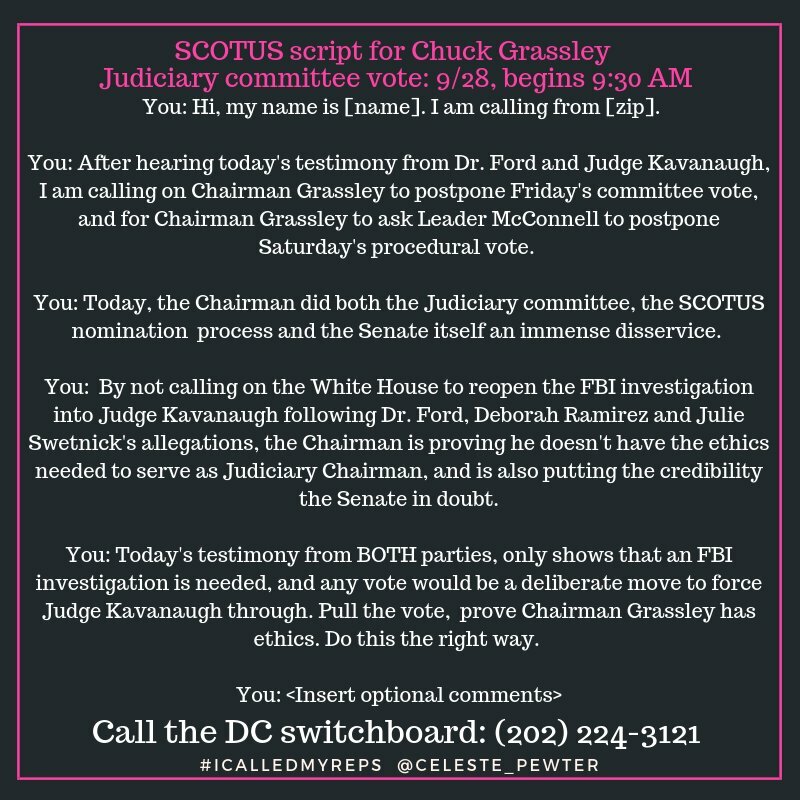 If one or both of your Senators are on the Judiciary Committee, it is extra-important for you to call. Only call your own Senators. 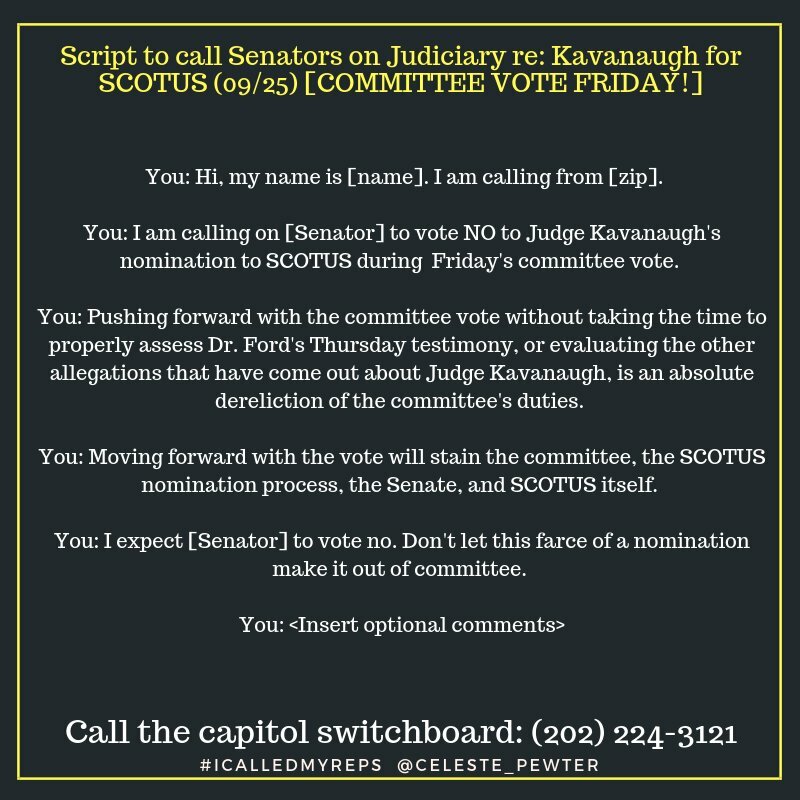 Urge your friends and family members to call their Senators. And yes, you have to pick up the phone and call, and I’m serious about only calling your own Senators. Be polite. Always, be polite. Practice what you want to say before you say it. Get it right, master your emotions, then call. This is as serious as it’s ever been, people. Only a large, loud outcry from us has a chance of stopping this nomination. 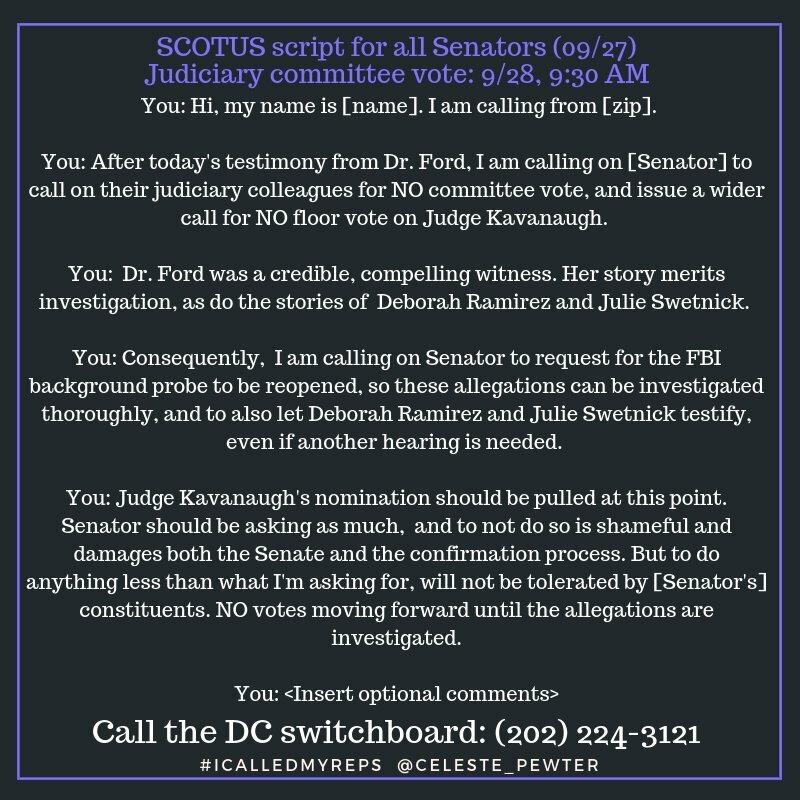 Please honor the bravery of Dr Christine Blasey Ford by making those calls, and then urge friends and family to do the same. Calling scripts from Celeste Pewter (@Celeste_Pewter) are below. To stay on top of things, check the Twitter feeds of @Celeste_Pewter for news on what you can do; @ICalledMyReps to see others acting alongside you; and @BenWikler for news about potential protests. 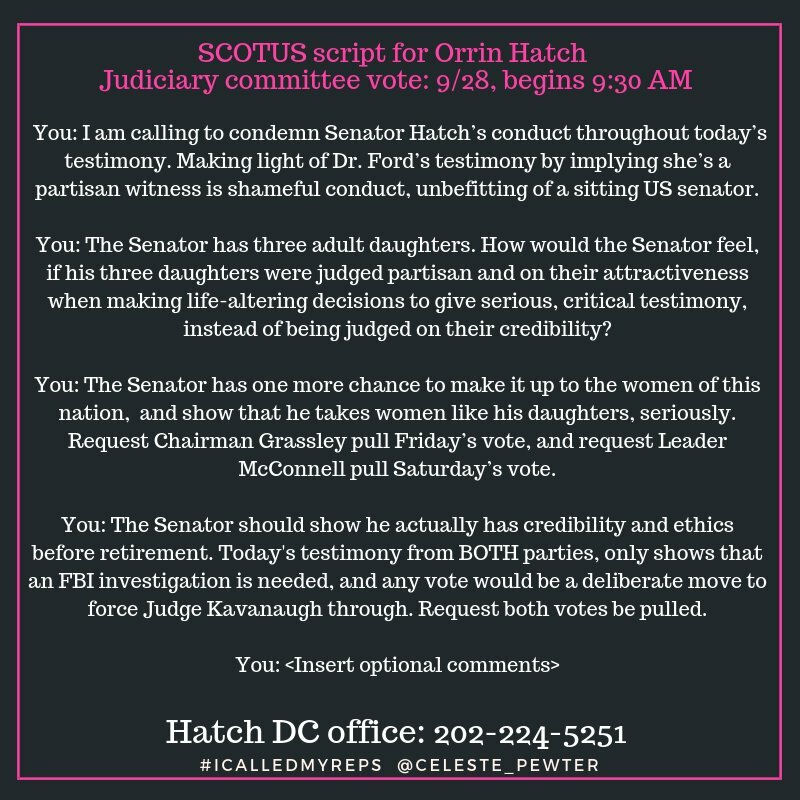 Here is Celeste Pewter’s general script for all Senators. Please check her feed, @Celeste_Pewter, for the freshest, most up-to-date scripts. The previous script she wrote for speaking to Judiciary Committee members appears below this one. And here’s the broken-out list of all current sitting members. Again, only use this to ID Senators who represent you or the home states of your friends and family. The Senators’ offices will disregard calls from non-constituents and might use them as an excuse to dismiss any pressure they’re feeling from their legitimate constituents. And again, compose yourself, and be unfailingly polite when you call.